In the late 1980s, a generation of filmmakers inspired by the directors of the 1970s began to flower outside the studio system. In the following decade, the independent movement bloomed. Steven Soderbergh, Quentin Tarantino, and dozens of lesser-known filmmakers began walking away with prizes at Cannes and eventually at the Academy Awards. Many of these directors were discovered at Robert Redford's Sundance film festival and were scooped up by Harvey and Bob Weinstein, whose company, Miramax, laid waste to the competition. In "Down and Dirty Pictures", Peter Biskind tells the story of the filmmakers and the independent distributors who revitalized Hollywood over the past decade. He follows the growth of Sundance from a regional film festival to the premier showcase of independent film that it became, showing how it succeeded almost despite Redford, whose visionary plans were often thwarted by his quixotic personality. He charts the meteoric rise of the controversial Harvey Weinstein, often described as the last mogul who, with his brother, left a trail of carnage in his wake, yet created an Oscar factory that is the envy of the studios. 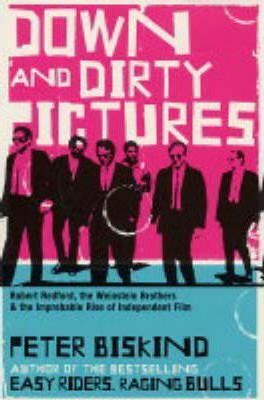 Candid and penetrating, "Down and Dirty Pictures" is a must-read for anyone interested in the film world and where it's headed. Peter Biskind is the author of three previous books. Currently a contributor to Vanity Fair, he was formerly the executive editor of Premiere and has written for numerous publications. He lives in Columbia County, New York.